Hello, I'm back again and this time I'm proud to present to you the latest addition to my Imperial Guard army. 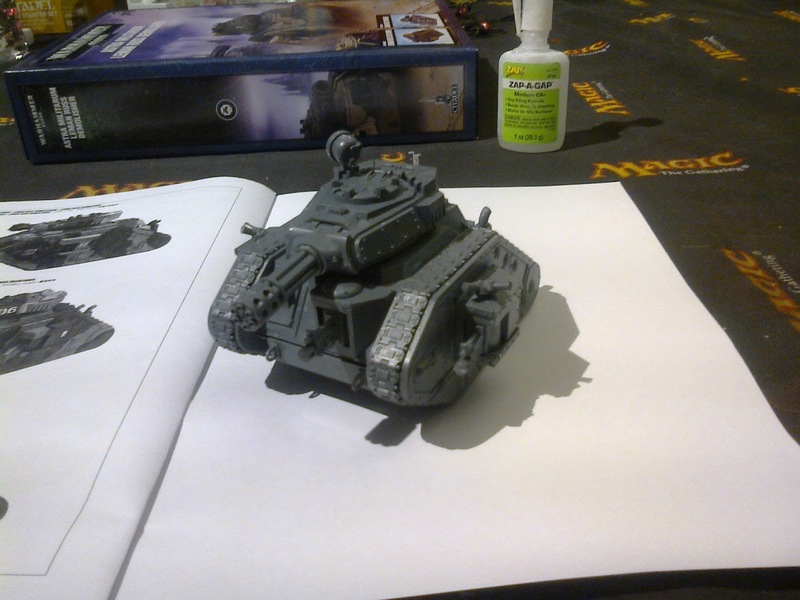 The Leman Russ Punisher! This completes my set of tanks and I now have 3 Leman Russ tanks. My plan is to make the Leman Russ Punisher a tank commander, upgrade him to Knight Commander Pask (Knight Commander Hasekura Kouhei in my own narrative) and make him the warlord. That way he gets Preferred Enemy, which he confers to his Leman Russ squadron that includes 2 Leman Russ Executioner tanks! And each of the Leman Russ Executioner has plasma cannon sponsons! It's going to be 10 plasma blasts in one attack! HA HA HA HA HA HA! DIE, you damned Space Marines! DIE! DIE, you stupid Terminators! JUST DIE IN HOT BLAZING PLASMA! HA HA HA HA HA! *Koff koff* Theatrics aside, it seems my mech army is shaping up. I would love to call my mech army a tank army but I don't have enough tanks for that. 3 Leman Russ tanks mean that they aren't the focus of my army and are only here to support my other units. However, what is my focus then? I only have one Veteran squad in a Chimera (coming soon) and the 2nd Veteran squad in a Valkyrie (also coming soon), so it's not exacty a Mech Vet list either because I only have the minimum number of Veteran squads (2!) and I have no meltaguns at all. So I can't do a melta driveby either. And where are my Storm Troopers?! It's not flyer spam either because I only have 3 flyers. 2 Vendetta gunships and 1 Valkyrie assault carrier. Artillery? 3 Wyverns. That's it. No Basilisks, no Manticores, no Deathstrike missile launchers. Does that count as Artillery? So what is my Imperial Guard exactly? A "balanced" mech list that features minimal Mech Vets, one-third tanks, one-third flyers and one-third artillery? Oh, and I forgot. I'm adding an Imperial Knight, specifically a Knight Crusader to the list. So that makes it a weird list that tries to be a bit of everything but doesn't really specialize in anything. Well, actually, my Imperial Guard army does specialize in one thing. Killing everything. Terminators? Monstrous Creatures? Leman Russ Executioners and their plasma weapons. Tanks and other vehicles? I hope 2 Vendettas are enough, and I still have my Knight Crusader with his rending Avenger Gatling cannon. Infantry and blobs? Hah! That's what my 3 Wyverns are for. And if that's not enough, my Valkyrie with multiple rocket pods and heavy flamer & 2 flamers Veteran squad will clean them up. Really, the only thing I'm missing is probably anti-vehicle. 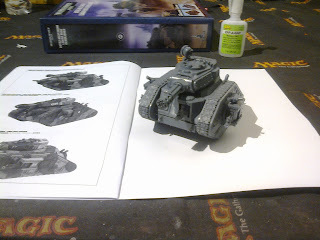 I can still do terrible, terrible stuff with Knight Commander Pask and his Punisher, which turns him into an anti-Monstrous Creature/Gargantuan Creature and anti-vehicle and anti-infantry all-in-one Leman Russ tank. Hilarious. So basically the only stuff I need to get are my Chimera, Valkyrie and 3 Wyverns. I can swap a Chimera and Wyvern for a 2nd Valkyrie but......I don't know if I should do that. Nah, maybe not. If I have the money, I'll slowly add a 3rd Vendetta and 2 Leman Russ Battle Tanks, which I will swap my Knight Crusader for. I don't know if it's worth it but it'll definitely turn my Imperial Guard into a tank army. But really, I'm not convinced. I think a Knight Crusader with Stormspear rocket pod is superior to a Vendetta and 2 Leman Russ Battle Tanks. I guess I won't do that then, let's save the money! Lastly, look at what I've gotten today! 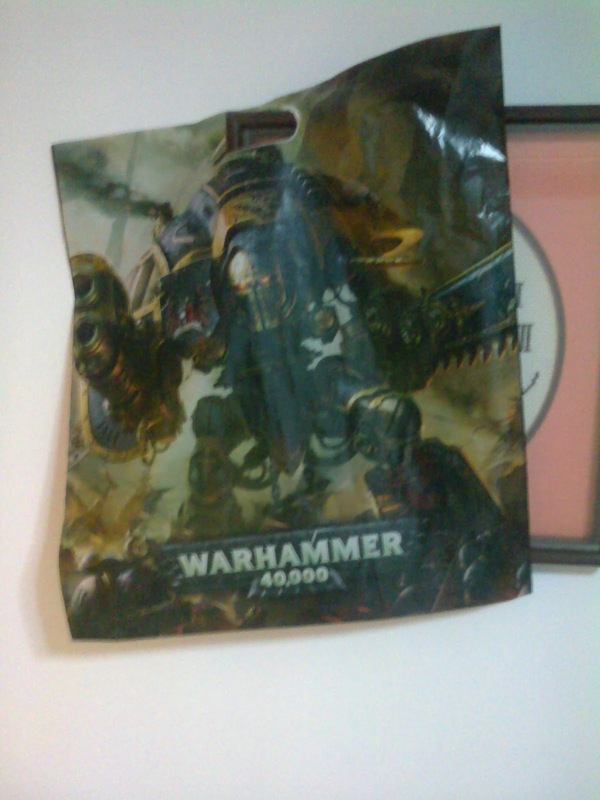 An Imperial Knight plastic bag! I'm going to treat it as a poster and hang it up proudly. The Imperial Guard and Imperial Knights are my two favorite Warhammer 40K factions and I really like hanging the Imperial Knight up there in my room. Skitarii and Adeptus Mechanicus in general comes a close third, but it's the Imperial Guard and Imperial Knight that's my true calling. YES! For the Emperor! "Knights of the Imperium!" I shouted. "We march!" Speaking fo which, I'm currently writing a chapter in War Convocation where the Skitarii faces off against the Necrons. Can you imagine? Two ruthless armies of cold, mechanical killers squaring off against each other and fighting in silence, with the roars of their weapons the only sound of combat? I'll post an excerpt tomorrow. Skitarii versus Necrons, it's going to be the fight of the millennium! I wonder if anyone has written on that before? !